This is an exciting internship with ILGA, the world association of more than 1200 LGBTI (Lesbian, Gay, Bisexual, Trans and Intersex) members’ organizations. 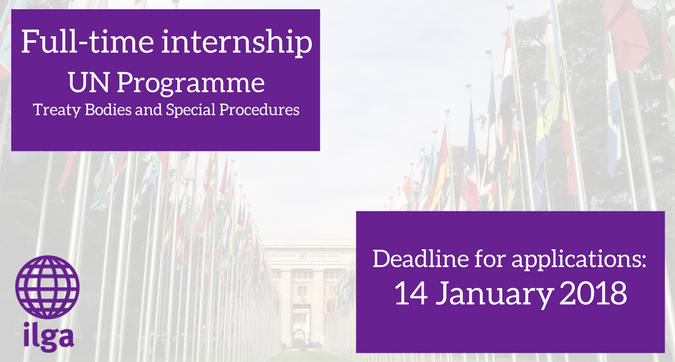 The intern will provide assistance to ILGA’s United Nations Programme (Treaty Bodies and Special Procedures component). It is an excellent opportunity for somebody who has an interest in human rights and LGBTI issues and wants to gain experience in working on them within the framework of the United Nations human rights mechanisms. The internship is for a period of six months, commencing on 5 February 2018 and ending on 4 August 2018. The exact working hours and dates can be flexible, but a candidate should be available to work full-time (37.5 hours/week). Carrying out organizational and administrative tasks together with other UN Programme staff members. Excellent level of written and good level of spoken English. Other UN language skills (Spanish, French, Arabic, Chinese and/or Russian). The successful intern will have opportunities to work with representatives of LGBTI organisations from around the world and other NGOs virtually and/or in Geneva. Due recognition in publications and activities which the intern has contributed to. Two contacts for reference purposes. All the applications should be submitted to Kseniya Kirichenko kseniya@ilga.org. Please put ‘UN Internship (TB & SP)’ in the subject line of your email. Process after application: Shortlisted candidates will require to complete a written task (23-26 January 2018). The interviews will be conducted in person for the successful candidates applying from Geneva and via Skype for those applying from other locations (29 January 2018-1 February 2018). Please bear in mind that if you have not been contacted by 23 January 2018 you have not been selected for the position. ILGA is an Equal Opportunities Employer. It aims to ensure that all full-time and part-time employees, potential employees and other individuals receive equal treatment. ILGA promotes gender and equality mainstreaming. Hence it actively promotes equality in all policies and actions. All applications will be treated with the strictest confidence. If more than one applicant is considered to be equally qualified for the position, priority will be given to applicants coming from marginalised and/or underrepresented groups.